Be the first to share your favorite memory, photo or story of Twyla. This memorial page is dedicated for family, friends and future generations to celebrate the life of their loved one. 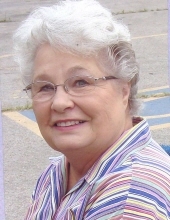 Twyla Mathis, age 82 of New Providence, IA, passed away on Monday, April 8, 2019 at Scenic Manor in Iowa Falls, IA. Twyla Ruth Mathis was born on October 31, 1936 in Clark County, Iowa. She was the daughter of Milo Clifton and Ida Pearl (Driver) Smith. She received her education by attending schools in Clark County, Iowa. On March 5, 1955, Twyla was united in marriage to Francis Fred Mathis in Osceola, Iowa. Twyla began her working career sewing at Snowdon’s Factory in Osceola. She was an inspector and auditor as well for the factories. After the family moved to the Hubbard, Iowa Falls and Eldora area, she took time between jobs to raise their six children. Throughout her working years she provided babysitting in their home. She loved walking beans with her children and had her own crew working for Ottlie Seed Company in Marshalltown. She then worked at Dodgers in Eldora for 25 years before retiring in 1997. Twyla was a member of the Honey Creek New Providence Friends Church and USFW. She taught Sunday School and Bible School and was on several church committees. She did volunteer work at Quakerdale and The Soda Fountain for Monday morning breakfast. Twyla passed away Monday, April 8, 2019 at Scenic Manor in Iowa Falls. Those remaining to cherish her memory include her six children, Stephen and his wife Sheri of Hampton, Melvin of Eldora, Sandra and her husband Douglas Tjarks of New Providence, Myrna Mathis of New Providence, Rhonda Wood of Iowa Falls and James of New Providence; 11 grandchildren; 22 great-grandchildren; six sisters; seven brothers; along with other relatives and friends. Twyla was preceded in death by her parents, husband Francis and one sister. Memorial contributions may directed to the family. To send flowers or a remembrance gift to the family of Twyla Ruth Mathis, please visit our Tribute Store. "Email Address" would like to share the life celebration of Twyla Ruth Mathis. Click on the "link" to go to share a favorite memory or leave a condolence message for the family.